Update: Picking a perfect moment to prove Fitch's point, Bloomberg reports that the Italian government may call a vote of confidence in the Senate on the migration measures. This would aim to strong-arm Five Star dissenters who face expulsion from the party if they vote against the government. Additionally, Five Star and the League are also at loggerheads in the lower house of parliament over Five Star’s demand in an anti-corruption bill to scrap time limits on how long people can be prosecuted after an initial trial. Salvini has said the government must “avoid trials that last forever, also for the innocent, which would be a defeat for everyone." It appears that if the internal bickering within Italy's "coalition" government continues, the EU may just opt to wait to discuss the Italian deficit with whatever government comes as a replacement. While European bond traders have been focused on the escalating standoff between Italy and Brussels over Italy's budget-busting deficit proposal, which culminated this morning with EU's Dombrovskis warning that the European Commission is considering a sanction procedure against Italy if the budget does not change - even as Italy has sternly refused to change the budget - this morning the head of Fitch's sovereign ratings, James McCormack, warned that uncertainty involving Italy's coalition government is as great a risk for BTP investors as the budget for the simple reason that the government may not survive as its members are "too different." Speaking on Bloomberg TV, the Fitch strategist said that there are not many things that the coalition partners agree on, and that raises questions about the government's survival. "We are not convinced that this coalition government is actually going to survive. It has very different coalition partners" and there are "not many things that they agree on", McCormack said. "Then the question becomes: what happens then? Political uncertainty is not finished in Italy,” he added, expecting Italian political fireworks to continue well into 2019. 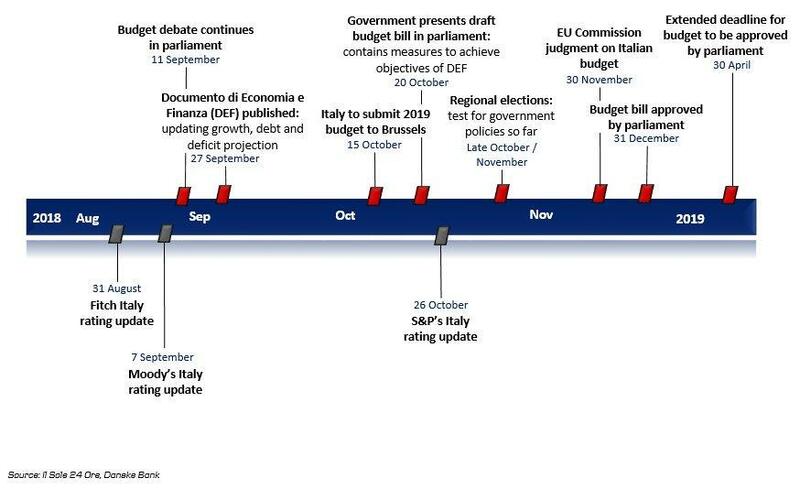 As a reminder, there is a November 30 deadline for the Italian budget to be approved by European Commission, which then has to pass Italy's parliament by December 31, with an April 30 "Plan B" extended deadline for Italian approval. 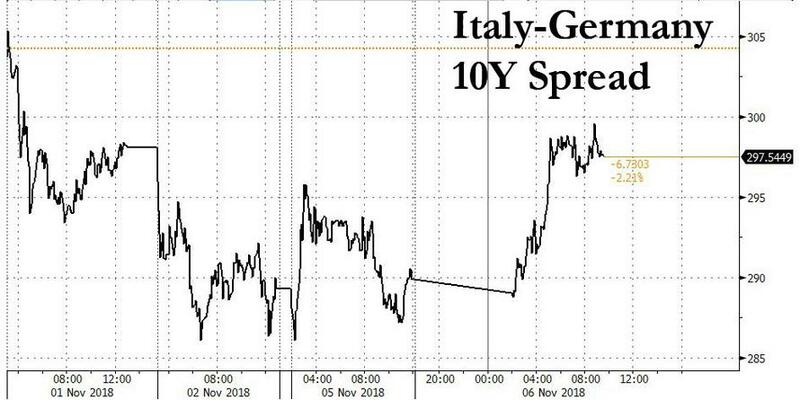 The Fitch analyst also said that if yields on Italian bonds go higher - whether with the active involvement of the ECB, which can be quite convincing as Berlusconi recalls all too well, or without - "this could force the Italian government to think of a different strategy." The silver lining to McCormack is that there hasn’t been a blowout in debt-to-GDP, yet: "the debt dynamics are not great, because we are not seeing declining debt. 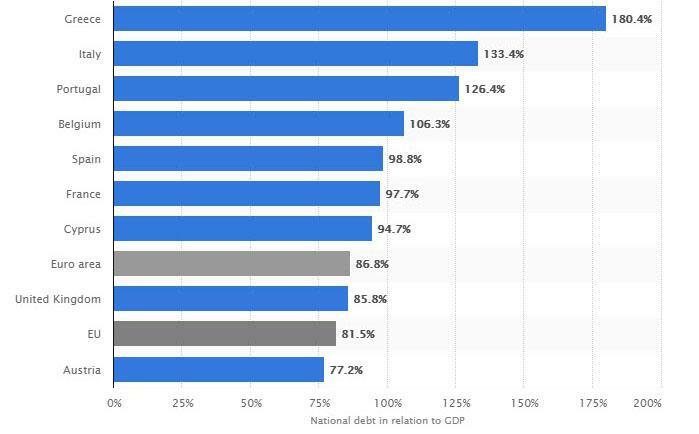 But the debt is not increasing. The debt is pretty stable. It’s high, but it’s stable." That will change if the Italian budget passes, as proposed. Which is also why the European Commission will not allow it to happen. As Bloomberg notes, this means the Italian bond drama could drag on well beyond the budget standoff deadline and volatility may rise as the market deals with two-way risks. Furthermore, if this government collapses in the near future, it would not mean the end of fiscal challenges for Italy. On the other hand, the coalition cabinet has little choice: with Italian growth so weak, it's not clear if any government can stick to the EU's budget rules given potential economic and social costs. Which is why Salvini, Di Mateo and company are trapped, are damned if they cut the deficit, damned if they don't. The market is starting to realize this, and the BTP yield spread is edging back toward 300 bps, which is already 1.35% above the five-year average. The one thing Italy has going for it, is that its debt-to-GDP ratio, while high, has been steady around 133% over the past five years (if still the highest in Europe after Greece). But that can change with this or another government. As Bloomberg concludes, "with the EU's Moscovici raising pressure on the budget, the situation might get much worse before it gets better."